Awesome quality, they washed up great and keep their shape. 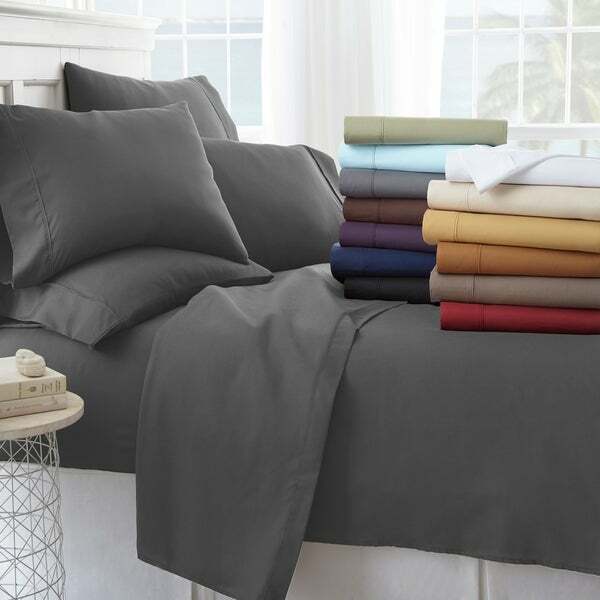 Made of fine imported double-brushed microfiber yarns creating a new standard in softness and breathable, this 6-piece sheet set will make it incredibly hard to get out of bed in the morning. Our premium yarns are two times more durable than cotton, completely wrinkle free, and perfect for all seasons. This set is available in a variety of color options. Available in white, cream, gold, sage, grey, navy, aqua, purple, burgundy, chocolate, black, light gray, Ivory. Dimensions 11.0 In. X 10.0 In. X 6.0 In. These sheets are certainly soft. What bothered me, is how thin they are. You can clearly see the mattress pad through the white sheets, and also see the actual pillows through them. I guess I was expecting thicker quality sheets. I can't attest to the other colors, but if you are looking for the chic 'hotel' look, buy your white sheets elsewhere. The reason I'm on this site again is to look for these sheets! That is how much I like them. Incredibly soft and great quality. Ordered as a gift. They claim to fit mattresses up to 16inches deep. No threadcount was given online or on the packaging. It says microfiber, but this is very thin and a bit translucent. It is not like I expected microfiber to be, not like thick, dense lens cloths. It doesn't have that smooth ultrasoft feel of microfiber, they just feel like cheap woven sheets. Haven't decided about keeping them. I might but I don't expect them to last very long as thin as they are. I love these sheets! My mattress is rather old and is not as think as mattresses purchased today. Most sheets today have "deep pockets" and cannot be used on my mattress. While these sheets did not provide the pocket size, and the deep pockets all did, I looked closely at the picture in the add. They mattress looked like the size of mine. As luck would have it, they fit beautifully! They are very soft and the quality is very good. I may buy another set since they fit so well. I LOVE microfiber sheets, and these did not disappoint. They are incredibly soft to the touch. I am always cold, and these never seem as chilly as those made from other fabrics. The extra pillowcases are really handy, both because pillowcases always seem to get worn out before the sheets do, and because I like to take one with me when I travel. Hotel linens always irritate my face, and covering my pillow with my trusty microfiber case lets me sleep better and wake up without a red face! Unfortunately, I sometimes forget to bring it home, and these extras give me a little leeway from memory lapses. The fit seems fine, and these sheets launder well. I absolutely love these sheets! I bought two different sets of sheets from two different companies before purchasing this set. I was not very satisfied and hate the online return process so I ended up keeping them. I came across these and the reviews were very good so I decided to take a chance, third times a charm! They are so soft and the size is perfect. I have a deeper mattress and sometimes it is difficult to find the right fit, even if it says it will fit. The color selection is great with neutral colors to fit anyone's taste and style. I will be purchasing another set for gifts and myself. I ordered the queen size for my queen size bed. Fits perfectly! corners of the sheets stay in place. I bought the gray color, it's a very nice color that compliments my decor. Very comfortable. Perfect amount of softness. Washes well, too. So very soft! Fits great! Will be purchasing another set very soon. Quality materials. Very satisfied! Rich color! My husband even loves them! Love that there are 4 pillowcases. The sheets are very soft, comfortable and wash up great! For the price, they are wonderful! I have bought several sheets within this price range from other stores and other companies and none of them match up to the quality! Would Love to order them in every color! These sheet are so soft and fit my bed perfectly. Perfect fit for twin xl. Very soft. Good quality. I was a little disappointed when I open the package and saw the sheets. They were very thin and had very small hem. But after I washed them and put them on bed they looked very nice. They didn’t wrinkle at all! I slept on them and they are nice and my skin felt cool. They are so much better than I thought. First impression was not spot on. Lol. Like the quality, highly recommend. Softest sheets ever! So cuddly. I'm ordering more. Good value, quick shipping and nice sheet set. Thank you. These are very nice and comfortable. I have made gifts with these and the person have since start making purchases from your website at Overstock .com. keep up the good work. I bought these sheets for a guest bed that won't get a lot of use. They are very soft but a little on the thin side. They will work very nicely for what I want them for. Yes, these sheets should stay issue free as long as the cleaning instructions are followed. Cleaning Instructions. Machine wash on gentle cycle in cold water with similar colors. Do not bleach, iron or use fabric softener. Tumble dry on low heat. "Is elastic all the way around the fitted sheet"
Yes, the elastic does go all around the fitted sheet. "how deep is the fitted sheet pocket"
"are they stain resistant ??" Stains come out of my sheets pretty easily. But then again, I purchased the white set and I put it to wash with my other white laundry with bleach. The sheets came out just as white as when I purchased them. "I have a queen bed and am looking for sage colored sheets the only size they have available in sage is king. Would that work for my queen bed?" The fitted sheet would be too large. "May I order in twin xl sizes and grey colors?" I'm not sure but it should tell you when you click on the sizes and colors. I have microfiber sheets I love and cannot find the same ones, so tring these. Just to try them out. The price couldn't be beat. like the fact that it was a 6 piece sheet set.